I am pleased to announce, once again, this very special tour to South India - an 'insider's experience' to the beauty, splendor and romance of this ancient land coupled with a culinary passage through a variety of cuisines that differ from region to region. 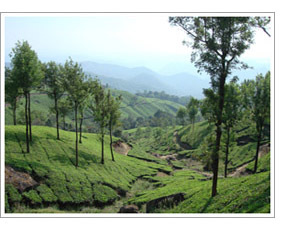 Our 11-day tour encompasses some of the most spectacular sights, sounds and tastes of South India. You will view the distinctive horticultural and agricultural practices handed downand through the centuries and will trek where the spices and herbs are grown, rice is harvested, tea and coffee are cultivated. You will see how cardamom and black pepper are processed and natural jaggery sugar is produced from the sugarcane. You will wonder the Bazaars in Cochin, the spice capital of the world; cruise the Backwaters of Malabar and observe the great Kathakali-the classic dance of India. You will visit colorful markets, participate in several cooking demonstrations and enjoy varied cuisines ranging from Gujarat Marwari, Jain and Tamil vegetarians to Konkani and Kerala seafood, Goan and Parsi delicacies, to Mumbai's famous street food chaat. The enticing program is designed to embrace the Indian culinary heritage. You will return with an enriched experience and knowledge, providing you with a better understanding and appreciation of this country and its cuisine. Custom planned and offered exclusively by Julie Sahni, this 11-day tour includes Mumbai (Bombay), Kochi (Cochin), Kumarakom, Tekkady, Madurai, and Chennai (Madras). .
For detailed itinerary, tariffs and additional information, please inquire online or call (888) 606-5333. The Glorious Moghuls: Culinary Splendors of North India, October 1-10, 2019. I am very pleased to announce, this incredible 11-day tour of North India -glorious Moghul India, royal Rajasthan and the spiritual Varanasi, a land of contrasts, that combines the rich tradition of an ancient past, represented in its rich culture, monuments and extraordinarily delicious cuisne. The 11-day tour of North India, observe distinct Moghul and Hindu architecture and a mosaic of diverse religious traditions as you travel through the ancient Indian Rajput, Sikh and Moghul cities. You will visit the opulent Taj Mahal and the unique "Pink City of Jaipur where you will ride an elephant! 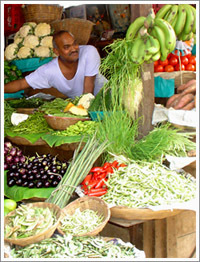 Exclusive spice and vegetable market visits and lectures with Julie Sahni. In Varanasi you will visit the 6th century BCE Buddhist pilgrimage site Sarnath, and go on boat ride at sunrise on the Ganges. Special cooking demonstrations and feasts, arranged in private homes with expert cooks, will delight your palate. This tour will introduce you to diverse and delicious tastes of Moghul cuisine, Kayasth business community, Rajasthan Jain and Ayurvedic Varanasi vegetarian, Marwar royal and Punjab foods of Delhiwalas. Vegetable bazaars, wheat fields and typical Indian farm kitchen will give you glimpses of rural landscape and culture - a different India. All Luxury, deluxe and first class hotel accommodations, most meals, including receptions and dinners, visit to the Taj Mahal, twice, at sunset and sunrise, elephant ride to Amber fort, boat ride on the Ganges, the hotel and domestic airport transfers with portage supplimented with area experts and on-site guides, specially arranged banquets, temples, farm kitchens and fairs, cooking classes and all sightseeing and entrance fees, and comprehensive advise and information on pre-travel planning. 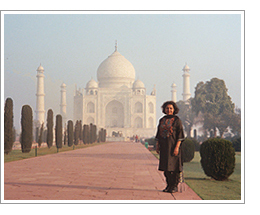 Custom planned, offered and led exclusively by Julie Sahni, this 11-day tour will cover Delhi, Jaipur, Agra and Varanasi. For a detailed itinerary, tariffs and additional information, please inquire online or call (888) 606-5333.